Let me start by saying, we not agents or brokers who sell puppies for other "Breeders" who live all over the country. We do not sell puppies site unseen or from a photograph. 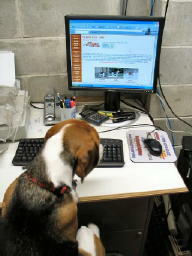 When you call and inquire about our puppies, I (the breeder) answer the phone. Not a salesperson from a faceless breeder trying to sell you a puppy from a photo. So many times people buy a puppy thinking it's not going to change their life. Wrong! If you're not willing to embrace this puppy as the newest member of your family and make decisions based on the best interest of your dog, it's not time for you. If you're not ready to deal with vet bills, housebreaking, the day to day love, attention, and maintenance required with owning a puppy, it's not time for you. I'm not trying to talk you out of anything. I'd just like to give you a few things to think about before you make that HUGE decision to bring a new puppy into your home. Before you buy a puppy from me, or anyone else for that matter, think hard about the points I will bring out in this message. Will your pup become an active member of your family or will he spend more time then he should in a crate? Going off to work at 7:00am and returning at 5:00 or 6:00 at night is a long time for any dog to be left in a crate, especially a high energy dog like a beagle. So think about how your work schedule will affect the alone time for your puppy, and is it fair to the animal. How will owning a dog affect YOUR life? Are you prepared to forego other activities in order to tend to the puppy's needs? Do you or anyone in your family have dog allergies? The time to find this out is before you bring your puppy home from your breeder, not after. The best way to find out if allergies are going to be a problem for you or any other family member is to spend time with your breeders dogs. After spending time with their animals I'm sure any allergy problems would have had plenty of time to surface. Do you have a safe place for your puppy to grow up? 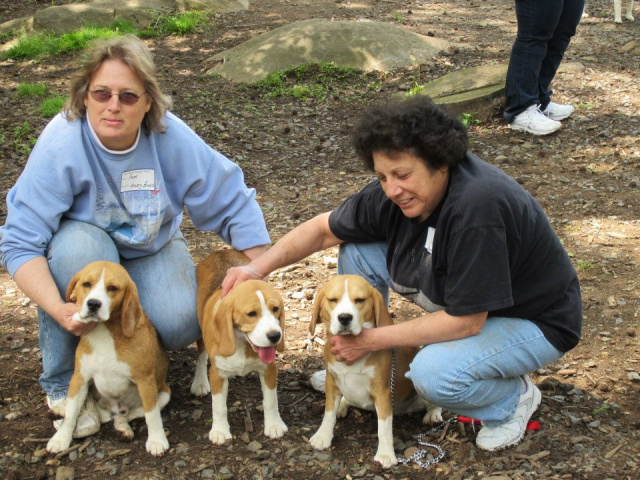 Did you know that beagles can not be off leash unless they are in a fenced in area? Living on a busy street without a fenced in yard could be extremely dangerous for a beagle. If you do not have a fenced area, are you willing to address this issue? If not, a beagle is not for you! Do you live in a condo, townhouse, or apartment? Will your dog be disruptive to your neighbors? Will your landlord allow you to bring a dog into his house or apartment? The time to find this out is before you bring a new puppy home, not after. How about house breaking a puppy? 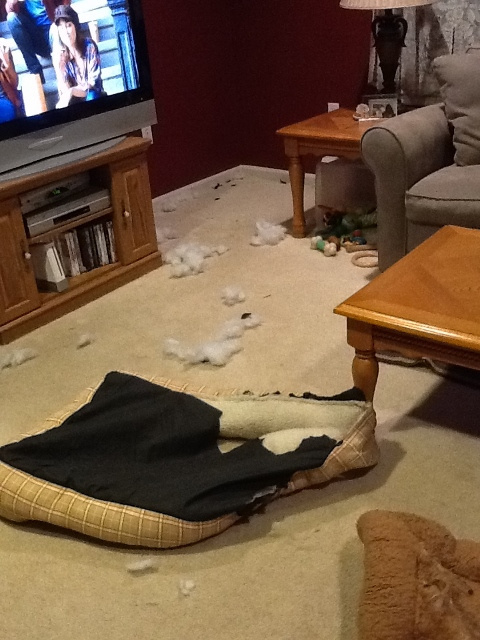 House training a puppy will take a lot of time, patience, and consistant work on your part, and believe me, accidents on your carpet ARE GONG TO HAPPEN! It's not an easy job, and if no one is home during the day it's very difficult for a puppy to learn where to go potty, which will be frustrating for the owner and the puppy. Seriously, do you have what it takes AND the time to house break a puppy? If you have any doubts, don't get a puppy. Puppy teeth are very sharp until about 4 months of age, at which time their adult teeth start to come in. Until then they will most likely chew your furniture, carpet, favorite pair of shoes, or even tear the stuffing out of their own bed. Puppy teeth could also be a problem for small children. I'm not going to kid you, puppy teeth hurt and even though a beagle is a wonderful choice as an all around family pet, making it through the "puppy stage" period could be a problem for a child. On the other hand, is your puppy safe around your small children? 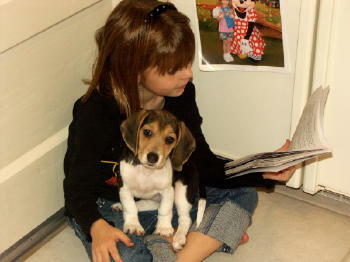 Perhaps a child will hold the puppy too tight, or sudden moves from a puppy could cause a child to drop him. Children get excited and and try to chase puppies. They could accidentally step on him and seriously injure him. These are things you need to consider before you purchase a puppy. Are your children ready/old enough for a new puppy? Your puppy will need regular trips to the vet for his health care, especially for the first few months. 2nd and 3rd puppy shots, and a rabies vaccination at about 4 months of age. He'll need monthly heartworm medication to be used as a preventative against this deadly disease. Flea and tick meds monthly. He'll need annual visits for yearly boosters and heartworm tests, and spay or neutering at 6 months of age. Office vistits can be costly. How about the possibility of unexpected medical emergencies that could cost a $1000.00 or more? 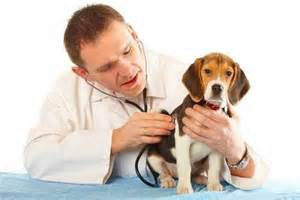 Are you ready and willing, and can you afford to provide health care for your dog? If you're not willing to accept this responsibility, don't get a dog. When you decide it's time to starting thinking about adding a new puppy to your family, be sure to start your search for your beagle at least 4 to 6 months before you actually want to bring your puppy home. Most breeders, including myself work off a waiting list and do not have puppies available on the spot. 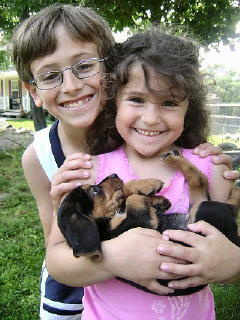 A lot of families make the mistake of thinking all they have to do is call a breeder and they'll have a puppy for them. That's not usually the case at all. What sometimes happens then is the family starts scrambling for a puppy, especially if the pup is going to be a Christmas or birthday gift. When they find there is nothing available, they could make a bad decision by ending up at the pet store. The best advice I can give you is find a breeder that you like and trust. Work only with them. Remember, you're not just buying a puppy, you're buying the knowledge, experience, and the advice your breeder can give you. Someone who will be there to answer all your questions, even after you bring your puppy home. That's not something you're going to receive from a pet store or an agent, not to mention all the other horrible things that can go wrong. And trust me, no matter how much they're trying to tell you they buy from reputable breeders, don't believe them. They are liars! 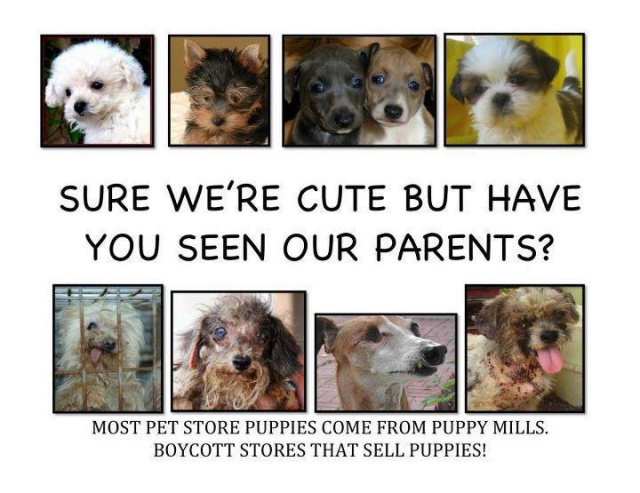 Most of their puppies come from puppy mills. The photos to the right are NOT our puppies. They are photos of puppies that came from puppy mills. The top photos are "The cute little puppies in the store window." Underneath are the photos of the mothers to those puppies. They are the poor helpless animals who are suffering and will continue to suffer as long as the public buys "The cute little puppies in the store window," or out of state breeders who are willing to sell you a puppy sight unseen. If you remember nothing else about pet shops, remember this, NO reputable breeder would EVER sell their puppies to a pet store. We want to know where our precious puppies are going. We want to stay in touch with our families and get updates on our puppies over the years, so don't let the pet shops fool you by saying they buy their pups from reputable breeders, because they DON'T! Be smart and stay away! Don't even go in the store. We've all seen the adorable little puppies in the store window. Trust me, I have too. It breaks my heart. I want to go in there and save them all, but that's what these stores count on, and what keeps the puppy mills in business is Our hearts!!!! So buy with your head, not with your heart, because buying your puppy from a pet store could bring you a BIG heart ache down the road. Something else I'd like to caution you about is buying a puppy over the internet from mass producing facilities who ship their puppies site unseen. No questions asked......They're only concerned with telling you how to make your payment. I just don't get why some people are willing to buy their puppy this way. I would think most people would want to see the puppy in person before purchasing it. Don't most people want to hold their puppy and see how he/she interacts with them? Don't most people want to make sure that puppy looks and feels healthy? Don't most people want to meet the parents of their new puppy and see the facility where their puppy was born? Don't most people want to meet the breeder and know if he or she is going to be around to answer questions once that puppy goes home with his or her new family? AND HERE'S MY QUESTION, " What do you do if you wind up with a sick puppy that you just bought and had shipped from 6 states away?" Do you ship him back? Do you get reimbursed for vet bills from the "breeder"? Do they even take your phone call or answer your emails? Please do yourself a favor, buy in person within your tri state area. I'm sure there are reputable breeders within driving distance of your home that are within your budget. Besides, by the time you pay for the puppy, his airline ticket, special crate, and vet certification, you're probably spending twice as much as you would from a more local breeder anyway, and you wouldn't be holding your breath hoping everything is really as good as they made it seem on the internet. If you have thought about all the points I have just brought out and still feel a puppy is right for your family, then I congratulate you. Owning a dog can be a wonderful loving experience for both adults and children. It's a tremendous way to teach your children to love, respect, and nurture life. To be kind, gentle and caring. A baby dog who needs them in the same way they need you. I'd also like to encourage you to have your new dog or puppy micro chipped. It's an easy procedure which does not hurt your dog. Some breeders offer it, or it can be done at your vets office. It's an inexpensive way where you will have a better chance of getting your dog back if he gets lost. It does not guarantee he will be found, but the odds are much higher he will be reunited with his family. Last but very very important, for the health of you dog, please do the right thing by having your dog spayed or neutered. Not only does it help protect the pedigree of the puppy you're thinking of purchasing but it helps control the pet poplulation by avoiding unwanted pregnancies. Thank you to those of you who took the time to read this page. I know it was a lot to read, but I definitely think everything was worth discussing. I hope it gave you a lot to think about before moving forward with purchasing a puppy. Hopefully it has given you the information needed to make good decisions. When buying a puppy, remember, if it's too good to be true, it's probably because it is. If it doesn't feel right, RUN!